I am writing this letter with much excitement for what God is doing in our lives and the lives of children and families we serve in Africa! He is so faithful and powerful; I am in awe of Him. This spring, I will be traveling with a group of volunteers to Sierra Leone in West Africa. The purpose of this trip is to restore safe drinking water to 5 communities affected by cholera outbreaks and recent Ebola Virus Disease (EVD) crisis. Each year, thousands of Sierra Leoneans affected by waterborne diseases. In 2012 alone, a deadly cholera outbreak left over 270 deaths and more than 19, 000 affected as a result of water-related diseases (WHO). On the other hand, the recent outbreak of the Ebola Virus Disease (EVD) and the poverty-stricken state of these areas has made most of the rural communities vulnerable to infectious diseases, occasioned by the unsafe drinking of water and poor sanitation. The Ebola epidemic killed over 3,000 people and made more than 10,000 sick in Sierra Leone between 2014 and 2016. The first and most important thing I am asking for is your prayers, as everything about this trip is in God's capable hands. I am also asking for financial support if, and only if, God lays it on your heart to support in this way. I am SO grateful for the donations we have already received which will cover our airline tickets and some of our feeding and boarding costs. It is necessary that we raise the remaining of $37,600 by December 31st for the water project. These amount will cover the cost of 5 borehole wells project in 5 communities in Lokomasama Chiefdom, Port Loko district. 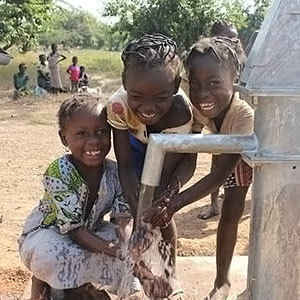 Safe Water for Sierra Leone is a nonprofit 501 (c) (3) Christian humanitarian organization which is devoted to the cause of providing clean and safe drinking water to the communities vulnerable of cholera outbreaks. In obedience to Jesus' command of loving our neighbors, we work with 'Jesus is King Deliverance Ministry' in Sierra Leone to implement projects that are beneficial to calamity- and poverty-stricken individuals. Being a non-profit organization, we are operating with the generous support of our sponsors, donors, and volunteers. If this program has stirred your interest, and you are contemplating on being a part of or supporting us, you may send your donation to www.safewatersl.org or call us at +1-915-262-6502 for our USA office or at +232-88-519-538 for our West Africa office. You may also email us at info@safewatersl.org. Thank you for your humanitarian concerns. Together, we can save lives. Remember, " no one has ever become poor by giving."